Need A School/Student Removals Company? Moving Location Or Into New Facilities? Russell Fewins experience and expertise in handling school/educational removals and move management projects means a trouble-free transition no matter how small or large the job. 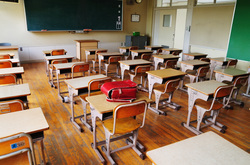 ​The key objective is to minimise the disruption to staff and students. We know that your available time is limited and that coordinating a move can be time consuming and stressful. This is why many schools that we have worked with in the past choose a managed move service. 1. Scoping and Planning the Project – making sure that everyone knows what to do, when to do it and how to do it. 3. Aftercare Service – our service to you does not end once the last desk is in place. Our After Care Service is part and parcel of our standard offer and is designed to eliminate the post-removal pains that may occur when the removers have gone. We recognise that it is important to schools to work with reputable organisations with a track record within the sector. Russell Fewins provides a BS 8522 standard accreditation, comprehensive, professional and wholly secure school removals service backed by full insurance and health & safety certification. ​We would be very happy to talk to you more about your project and how we have worked with schools in the past. Please contact us on 0800 783 7795 to find out more.